In a large pot with a lid, pour the oil and the popcorn into the pot. Cover pot, set on medium-high heat and wait for popcorn to begin popping vigorously. Using potholder, lift pot a few inches above the heat and shake back and forth until popping begins to subside. You should be able to hear the popcorn piling up and even beginning to raise the lid off the pot. Remove from heat, and spread on two large baking sheets. Salt to taste and sprinkle in peanuts. 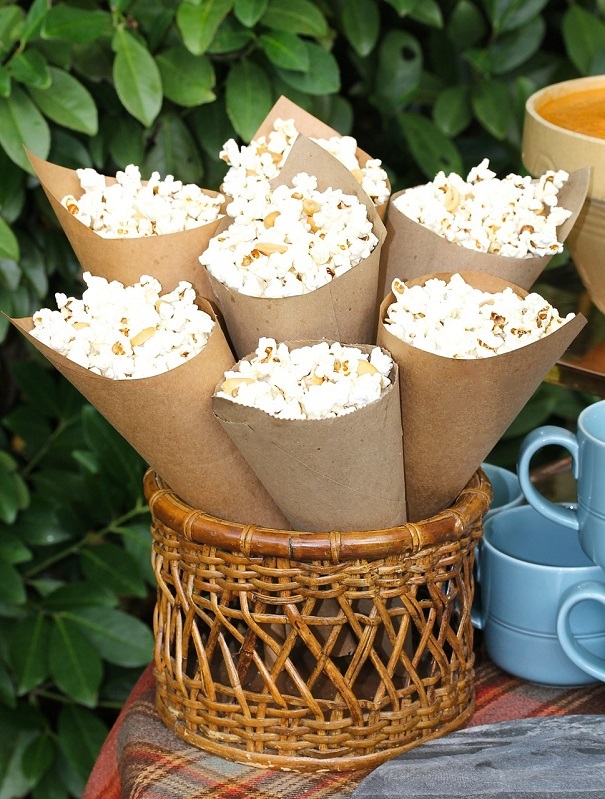 Scoop popcorn and peanuts into individual bags or paper twists. Popcorn can be kept warm by leaving them in a foil-lined pizza delivery bag, which can be purchased online for about $20. To make the paper twists, I used brown paper grocery bags, cutting them into 9×12-inch pieces, twisting each piece of brown paper into a cone and taping it at the side. So simple!